I'm highly fond of the Deciem brand, they're very innovative when it comes to skincare. I've reviewed their brands products a few times already through the blog, here, here, here & here. 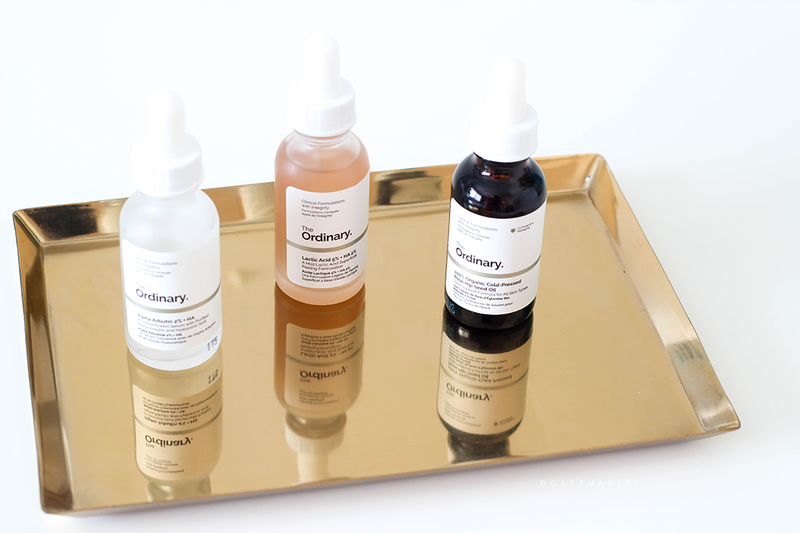 This year they launched The Ordinary, which is effective skincare at amazingly reasonable prices. I decided to try 3 of their products. This serum has 2% Alpha Arbutin which helps reduce the look of spots and hyperpigmentation. 2% is a higher concentration versus the 1% standard concentration. It's said to be the safer alternative to Hydroquinone, the main source of Alpha Arbutin is the Bearberry bush where it's derived from the leaves. Arbutin comes in alpha and beta, alpha is said to be better as it offers higher stability and preferred for skin lightening. Making is ideal for hyperpigmentation. The Hyaluronic acid ingredient is described as a next generation form, Hyaluronic acid is used to retain moisture within the skin (one gram (.03 ounces) of hyaluronic acid is able to hold up to six liters (1 quart) of water!) helping it to look plump and healthy. It can be used daily, AM + PM (sunscreen definitely needed after AM application). It's a clear liquid, watery serum, glides onto the skin to be absorbed quickly with no residue left over. I think this is going to be a great saviour during the colder months with being able to retain moisture but helping my other skin concerns, I find it gentle for what it's meant to do. Lactic Acid is found within milk and sugars - this is where it's derived from and it's antimicrobial, so it stops any growth of bacteria, gently exfoliates skin & prevents pigmentation (i.e. dark spots - doesn't whiten the skin, no bleaching *I stress this*). I'm familiar with a lot of acids, especially AHA (alpha hydroxy acids) as they're used to gently exfoliate the skin to help brighten by revealing new skin underneath and this is how it helps to stop hyperpigmentation. This acid in particular I've not had much experience with until as of late, from doing a body peel and then this. It's at a 5% level which is probably good for entry levels so your skin can get used to it and then you build up the strength. Within this mixture is Tasmanian pepperberry, it's a powerful antioxidant, anti-inflammatory, anti-acne & skin conditioning properties, it'll reduce the signs of irritation often associated with acid use. Also supports Vitamin C and collagen production. I've definitely not experienced any peeling or irritation. It took a while but the skin had slight places on my face where it started to exfoliate but it's always a good sign and my skin is starting to look a lot more brighter and even. The reason I choose to use this cold-pressed and organic Rosehip Oil is because of it's amazing benefits, to help aide all what I'm trying to correct. It's full of vitamins, antioxidants and essential fatty acids, these help skin concerns such as dark spots, reduce scars and fine lines and hydrates dry, itchy skin. The antioxidants have the ability to penetrate deep layers of the skin, Vitamins A & C stimulate collagen production. As I mentioned the dark spots are helped because the antioxidants combat free radicals that cause sun damage, this'll prevent dark spots from getting darker. Vitamin A & combined with essential fatty acids improve skintone, texture and pigmentation. They suggest to use it once a day, preferably at night but I use oils morning & night because I use it after my moisturiser especially if I'm not wearing make-up, it seals my layers and always gives me a non greasy but healthy sheen while working and protecting my skin. Have you tried anything from Deciem or The Ordinary? I am currently using Alpha Arbutin 2% + HA 30ml and so far it's kept my skin looking glowy as get into the harsh Canadian winter! I am loving The Ordinaries range so far and will be picking up a few more products! I can't wait to read more of your thoughts! Me too! Omg, I think I've found a range so affordable and what works. I'm glad it's also working for you. I've got a few more bits and got my eyes on 2 more products at the moment. I never tried from Deciem or The Ordinary. Seems good product. very detailed review. Thank you. You wouldn't be disappointed if you did. Effective but gentle. I agree and I love Deciem, they have amazing ranges and this one is by far my favourite. 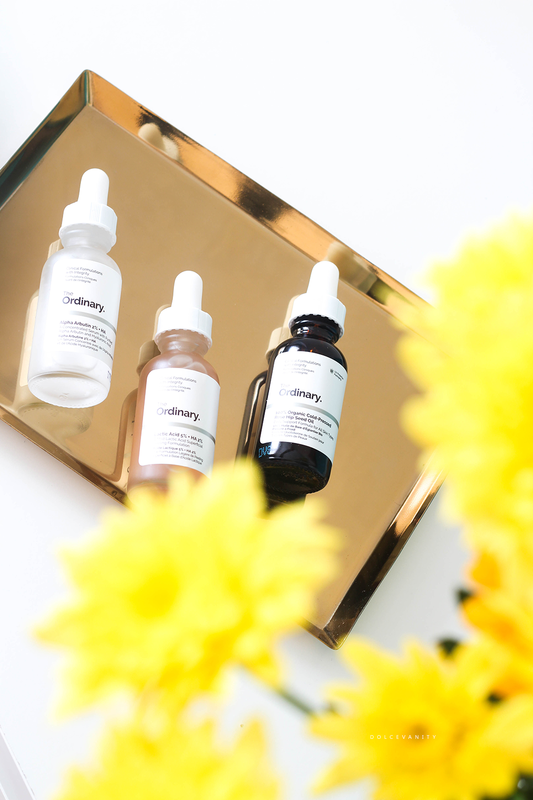 I have to admit I've not heard of Deciem or The Ordinary before but I love the bottles and they sound like they really could be so good for your skin. They are doing amazingly for my skin and soon I will be doing a top up of items because I'm going through these so quickly lol. I love when I feel like I'm paying for good quality ingredients and not just silicones and water. The lactic acid one definitely appeals me. Yes I agree. The lactic acid is good, I may try the 10% soon even though the 5% has been effective. Just up the ante. I love rose hip seed oil and this is such great value for money! Thanks for blogging about it! Definite must have, got some more to review and got my eye on 2 more products to try out soon. I have never tired Deciem before - they look a little like Aesop but without the price tag so I would be keen to give them a go! Oh yes Aesop is pricey. They've got amazing products to target skin concerns and so affordable. Fab photography here. I love DECIEM products a lot. Thank you Stella. The brand is fabulous and flawless. I haven't heard of them before, but I love the look of the packaging! I'd definitely try them! It's very clean and simple but still carries the information on the packaging. Very good products for skin concerns I have and they work so even better. Very affordable that it's criminal to not try the brand lol. This I have seen at home and I had no idea what it was or what it did until I read your post! Haha, yes BeautyQueenUK is also a groupie like me. You may love the brand just like us soon! I've never heard of this brand, the bottles look almost medicinal don't they. They do have an apothecary vibe to them. Do adore this brand. Second, i am defooooooo going to try this brand out now that i've seen this review!